AAvantage is the frequent flyer program of American Airlines, a Oneworld member. Through it's extensive partner alliance and own international routes, AAdvantage offers reward redemptions throughout the world. American publishes numerous reward charts based on origination as well as carrier. They have an American Airlines chart and a Oneworld partner chart. The American Airlines chart has a main cabin off peak saver category. American Airlines and partner Oneworld international destinations point levels are identical except for some minor Latin America differences and an off-peak saver main cabin reward to Europe. Economy class or "Main Cabin" has 4 categories of which two are saver rewards and two are standard reward. Saver rewards are MileSAAver Off Peak (explained in "Sweet Spots" below") and MileSAAver. Standard rewards are called "AAnytime" have a Level 1 and Level 2. Obviously the Saver rewards are what you want to spend your points on. For short hops of less than 500 miles there is a reduced rate, yet I can't imagine wanting to use points for an hour flight as there isn't much value to doing that. The amounts shown are for one-way travel. This reward chart applies to aircraft with 2 class cabins. Domestically you'd typically have an aircraft with a main and first cabin so this chart applies. Internationally you might have a 2 class aircraft that doesn't have first class, but has a larger business section and is referred to as Business/First (yes, it gets confusing) meaning this chart applies. However if you get an international aircraft that has 3-class, first, business and economy on your domestic flight you get to add 7,500 points to the routes inside the 48 states as well as from the 48 states to Canada, Alaska, Hawaii, Caribbean, Mexico, Central America or the northern region of South America. Use this chart for business class rewards (adding when necessary) and the first chart below for first class rewards. For example, you are going LAX to MIA and the aircraft is an A321 use this chart for first class (25,000). If it's a 3 class 777 use this chart for business class and add 7,500 to the MileSSAver (25,000+7,500=32,500) and then use the First class chart below for first (50,000). 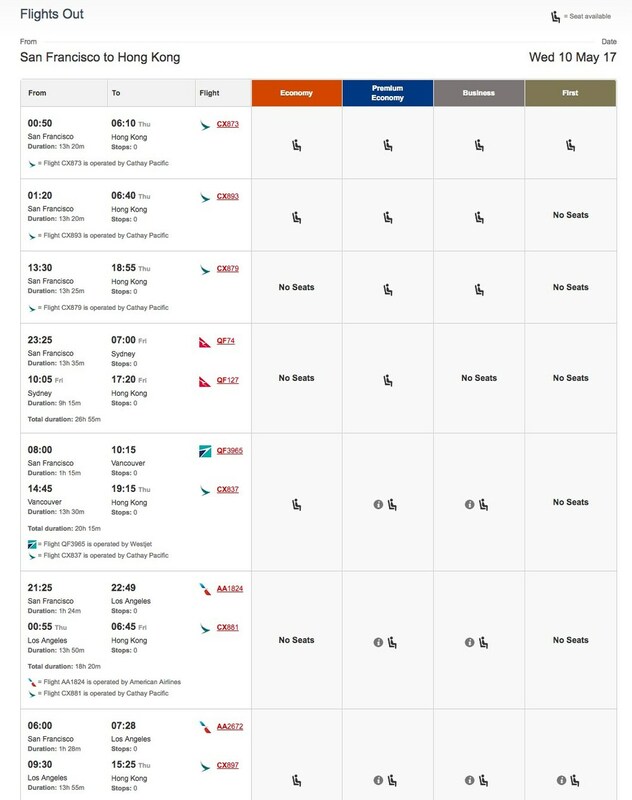 Economy to Asia Region 2 (Hong Kong area flying Cathay Pacific) requires 2,500 additional points. All classes to Caribbean, Mexico and Central America require 2,500 additional points. Surcharges are YQ or YR additions to basic fares. Without getting into the reasons they exist, most airlines include them in their fare pricing structure. However with reward ticketing these surcharges are sometimes waived. In the case of AAdvantage for the most part they are waived. The notable exception are reward tickets on British Airways and Iberia where AAdvantage will collect these extra fees. When searching for a reward ticket on AA.com and your destination is to Europe, London for example, you'll often find good availability. There will be a mix of carriers, mostly American and British Airways and the reward points required are the same. However when you select the British Airways flight and go to the redemption/ticketing screen you're in for a surprise. British Airways surcharges are typically at least $400 one-way and can easily get to $1,000 for first class. In this example both require 57,500 points, but the American flight has $5.60 in fees and the British Airways flight has $484.50 in fees. For other Oneworld carriers, other than Iberia, you will probably end of with less that $100 in taxes and fees. It all depends on the airport. The UK has the departure tax, Germany's airport taxes are high but most others are very reasonable. Online you can book American, airberlin, Alaska Airlines (partner), British Airways, Finnair, Hawaiian Airlines (partner), Qantas Airways and Royal Jordanian Airlines. For all other Oneworld members and American partners e.g. Etihad) you need to call reservations. However for these carriers you can't book online the ticketing fee is waived. Having booked Cathay Pacific, Etihad, Qatar and Japan Airlines with the phone reservation system I've found the agents to be helpful and efficient. Changes to travel dates under the same itinerary, meaning route and carrier are offered at no charge up to 21 days in advance after which you'll incur a $75.00 processing fee. To change an upgrade reward, the rules of the purchased ticket apply. In general you are governed by the fare rules for change fees and cancellation policies and only need to pay any additional co-pays that may be required as long as the mileage upgrade reward is the same. If you change itineraries that require a different mileage upgrade reward the original reward requires a reissue fee ($150) plus forfeiture of your original co-payment and payment of the new co-pay amount. American AAdvantage points expire after 18 months of no activity in the account. American has some generous routing rules but compared to other programs they can be restrictive. When using reward points for international travel the carrier used must publish a fare for the route. With alliances such as Oneworld and codesharing this restriction is becoming less problematic. However if you live in a city that isn't served readily by a Oneworld member it could be an issue. To see if your route has a published fare you could use Google Flights or their more robust program of ITA Matrix Airfare Search. The bigger restrictions are based on pre-defined regions. Of course the reward chart point requirements are based on regions, so let's have a visual of them. For travel to south of North America you must go direct to the region. For example to southern South America you can not transit through northern South America. From North American you must go Trans-Atlantic direct to Europe. *You can travel on Qatar Airways from North America to Africa by way of a connection through Qatar's hub in Doha. All Doha exceptions must be inbound/outbound on Qatar aircraft. The major restrictive route in this scheme is North America to South Pacific. You can't go through Oneworld hubs such as Tokyo or Hong Kong. This restriction makes getting to Australia/New Zealand more difficult because you have less options. Of course American flies to all these regions direct as well. You must book the most direct route. However American allows a very generous 125% of the IATA MPM, (International Air Transport Association Maximum Permitted Mileage). MPM is a proprietary calculation of what is considered the maximum distance in miles for a valid route. In the following example the actual miles for the route from A-B is 5,176 while the MPM is 6,225. The purpose is to allow for connections. American allows 125% MPM which means you can sometimes piece together the connections to get where you want to go when you find the international flight available and simply need to transit to that flight. Then I simply made up some connections with the assumption that an ORD-BCN international flight was open. To get to ORD the route is through DFW. Then from Barcelona the route is through LHR to Budapest. Plugging in that route to the handy tool Great Circle Mapper which returned an actual distance of you guessed it, 7,781. The maximum allowed. Obviously this is not the "most direct" route, but if it's all that's available then it's valid. American rewards do not allow stopovers in-route. A layover is considered 4 hours between connections domestically (leeway here if no flights scheduled) but no more than 24 hours internationally. So for the BCN connection to LHR in the example, you can't stay in Barcelona more than 24 hours which would be considered a stopover and not permissible. One-way tickets and open jaw tickets are allowed. Basically an open jaw is two one way tickets where the destinations are different (DFW-LHR and CDG-DFW). Another nice feature American has is the ability to reserve a reward ticket by placing it on hold. You are given 5 days to ticket the reward. (If departure is within 14 days you are given a 1 day hold.) This allows for other travel planning and is somewhat unique, at least among the domestic carriers. Reservations open 330 days before departure and can be made up to 2 hours prior. You may purchase a reward ticket for anyone using your reward points as long as that individual is identified at the time of issue. You can not change the name at a later date. To do so you must cancel, re-deposit and re-issue a new ticket and pay the corresponding fees. Once a ticket is issued you have 1 year to use the ticket. If you fail to use the ticket after 1 year you will forfeit the points. American has a robust online search engine for reward flights. From the home page of AA.com simply check "Redeem Miles" and enter your route and dates. Ultimately you will end up on the Plan Travel/Flights page which can be accessed directly from the Plan Travel selection at the top of all pages. 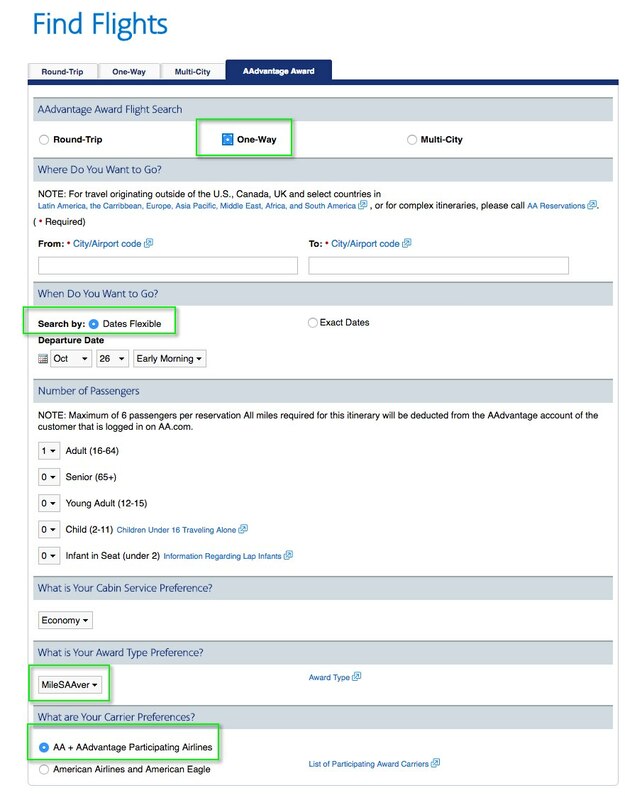 When on the Find Flights page make sure the AAvantage Award tab is highlighted. Fill in the blanks. It is recommended to search for one way rewards as there is no advantage to a round trip, simply do individual searches. Check the "flexible dates" button to show the calendar and make sure AA + AAdvantage Participating Airlines is checked. When searching for rewards on AA.com, only certain carriers are eligible. Select dates is the next screen. The available reward classes are colored; green economy, blue business and purple first with saver rewards a lighter shade. If any of the classes are not available these boxes will be greyed out. Click on any of the Award Legend boxes to show the available dates. You can also click on "Show Full Calendar" to get a full month view. Note the greyed out days meaning Business/First is not available. Also the arrows allow you to advance or go back in 2 week intervals which is handy when looking for an elusive reward like QF First. Pick a date and you will get to "Pick a Flight" screen where all the possible flight combinations are shown. In this case there are 4 pages of results. You can use the filtering and sorting features on the left to narrow down search results. Notice the red warnings. Going to Europe is almost always an overnight flight but the other warning states that a premium cabin is not available on one or more flights. To find out class, aircraft and seat specifics on a particular available itinerary click on "Flight Details". In this case it shows the DFW-ORD is Economy. Once on the ticketing page you will find out the total fees and any surcharges that apply. The "Multi-City" tab is simply going to return individual reward tickets. It is not a robust system that you can use to piece together connections. If you search a route and nothing comes as available, but you can search individual flights and create an available itinerary, as long as they fall within the routing rules you can contact AA reservations in an attempt to ticket the itinerary. The remaining partner and Oneworld members can only be ticketed for reward travel by contacting American Airlines reservations. * Partners and not part of Oneworld Alliance (may impact "published fare" rules using overseas carriers). There are a number of ways you can search for the other carriers. 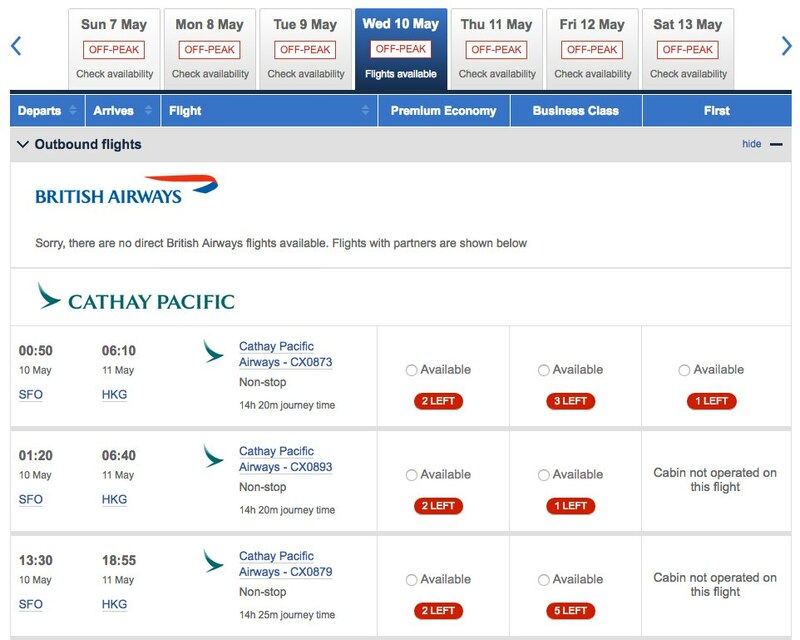 For international flights on Oneworld carriers you can use the British Airways or Qantas reward search tool. For these you will need a frequent flyer account number. These are free so simply signup. Log in to your account and do a search. This search is a number of months out looking for SFO to HKG assuming the flight will be on Cathay Pacific. Both sites returned availability with Qantas offering more choices. If you find your flight call American reservations to book. The major partner airline you can fly using American reward tickets is Etihad. To find an Etihad flight go to Etihad.com and do a search. You don't need to be an Etihad Guest (their FF program) member to search. You will only find Etihad flights. If the search shows GuestSeat available then you can redeem American points for that reward. Contact American reservations to ticket the reward. (Note: There was a period of time (and personally experienced by me) that the American reservations system did not see Etihad rewards in some cases. The solution was to contact American reservations in Australia. See this FlyerTalk link for more information. I would try American U.S. first to procure the reward. For other partners reward tickets search the carrier's website understanding that inventory showing isn't necessarily made available to other carriers. Further ways to search for American rewards is to use paid services such as ExpertFlyer or KVSTool. Or have RewardFlying ticketing do your searches. American has a special reward category called MileSAAver Off Peak that applies to American Airlines flights only. The savings are applicable to most international regions and saves 2,500 reward points per one way ticket. The dates are generous as well. Here is a listing of the current dates. The best saving is on travel to Europe where you save 7,500 points and is even applicable on Oneworld carriers. The dates however are somewhat restrictive; January 10-March 14 and November 1-December 14. The necessary points for redemption is only 22,500 one way. Premium class has some great redemptions as well. International Business/First values are competitive across both oceans. In particular to Asia 1 which is Japan/Tokyo at 60,000 for business and 80,000 for first is excellent. Both American and Japan Airlines have a great product. The Europe fare of 57,500 points is also great, just make sure you don't end up paying a large surcharge which negates the savings. And if you want to fly Qatar or Etihad to the Middle East, 70,000 is really good especially considering these are two of the best carriers in the world. If you hold an American Airlines branded credit card, you can save 1,000 to 7,500 points on roundtrip rewards to select destinations. Destinations are updated monthly. Typically these are North American secondary cities and not American hubs, however dozens of cities are supported. Two different discount amounts are offered based flight distance of more or less than 500 miles. In addition two categories of credit cards are applicable. Pick your destination from the list of cities which is updated monthly. Find your category for the credit card you possess then select your class of service along with distance or more or less than 500 miles Then Contact AA reservations and you could save up to 7,500 points. A round trip economy ticket with North America is 25,000 points. It is certainly possible to get a 7,500 discount on that reward making it a 30% discount. Even Business and First class rewards can get the discount. A round trip first class ticket on a 2 class aircraft is 50,000 points. With this offer it would only be 42,500 or a 15% discount. American allows one class upgrades from purchased fares. Two class upgrades are not allowed. Discounted fares require a co-pay plus points. Full-Fares only require points. Upgrades are allowed on American flights as well as British Airways and Iberia when full fares are paid for pre-upgrade cabin. Upgrades are applicable to one-way tickets and have a maximum of 3 segments. Reward tickets are excluded. Discount Economy class fares are codes; H,K,M,L,W,V,G,Q,N,O,S as well as Military and Government fares in Y or B. Full fare Economy is Y or B. Discount Business class fare code is I. When searching for paid fare flights on AA.com, to get full fares check that option on the flight details page. Otherwise I would recommend contacting American reservations to confirm the booking code, as well as see if upgrades are available, before you purchase the ticket. The decision to upgrade or get a reward ticket outright should be examined to see what is the best use of points, given that both options are available. This example uses one of American's newest long haul routes of Los Angeles to Auckland. A one-way business saver reward is 80,000 points. From a discount economy fare to business upgrade is the fare, 25,000 points and $350. From full fare economy to business is just 15,000 points without a co-pay. A discounted economy ticket is $874.00. An upgrade requires 30,000 points and $350.00. Based on a point being worth 2 cents each (often offered as a outright purchase price by American) the total cost is $1,723. Based on the discounted business fare you save $4,440 buying the ticket and upgrading. Using fewer miles without the co-pay is more expensive by almost $600. An outright reward is 40,000 points for economy (might as well buy the ticket as there isn't any great value) and for business it's 80,000 points meaning your cost is $1,600. In this case it's a toss up between buying a discounted economy ticket or an outright business class reward. If the upgrade is more readily available then that is probably your best choice. In addition you earn points for the paid portion of the fare (at least 4,000). Keep in mind any co-pays are NON-REFUNDABLE. You can earn points flying American Airlines as well as other carriers. As of August 1st, 2016 American Airlines converted to a revenue model where points are earned based on dollars spent and member status, similar to how Delta and United flyers earn points. You must belong to AAdvantage in order to earn points. A maximum 75,000 points can be earned per ticket. In addition you may earn points when flying with other Oneworld carriers and American partners by providing your AAdvantage number to that carrier for point credits. The majority of these carriers use a calculation of actual route miles then apply a percent based on fare class purchased to arrive at the total points earned. Use this link to see allocation tables for the following airlines. American's branded credit cards are issued by Citi. American branded credit cards offer sign up bonuses, multiple points on American airfares, boarding privileges, Admiral's Club membership and free checked bags. A nice feature you have an annual 10% bonus discount on award tickets each year up to 10,000 points. So if you book 100,000 in reward tickets your net cost is only 90,000 points. These credit cards can be viewed here. In addition to credit cards for United States citizens, American has international credit cards for residents of many foreign countries. American Airlines has a few transfer partners where you can earn points through those programs and move them over to American. Besides the best option of SPG they have some not so lucrative hotel reward transfer options. You can earn points with hundreds of sources. If collecting American points spending some time viewing these partners can help accumulate points faster. Links are provided. If your strategy is to accumulate and redeem American points then commit to earning American points on every financial transaction you do! Hotels - Full list of hotels you can earn AAvantage points. Car Rentals - AAdvantage members earn increased points as well as do Citi credit card holders using Avis and Budget. Make sure to use the discount codes when booking. Shopping - One of the best ways to supplement your point totals is to use shopping portals. Find the items you buy frequently and order them through the portal to earn thousands of extra points. Watch for specials and take advantage of them. Sometimes you can get 10-12 points per dollar spent! American's shopping mall has over 850 stores. Including in the shopping portal is a link to Booking.com where you can earn points for hotel bookings. Dining - American also has a dining program. Sign up and when you pay with your registered card you will earn extra points. Search your area for dining establishments that you may frequent. This is a no cost way to earn extra points. Bonus Offers - Check frequently to see what offers are available. Past offers have been as simply as opening a checking account and doing a limited amount of monthly transactions to earn over 10,000 points. e-Rewards - Spend a few minutes to take a survey and earn e-reward dollars. Turn those dollars into American points. For every $25 you earn you can get 500 American points. Book your hotels on these portals and earn points, sometimes very generous bonuses. American Airlines sells points on a regular basis. There is an annual purchase limit of 150,000, which can sometimes be exceeded with bonus programs. If you need to purchase points, always wait until there is a point sale. Often you can purchase the points at 2 cents or less and you shouldn't buy them at higher prices. Purchasing points can be a great way to get a deal on airfare. It takes 115,000 points to fly round trip to Europe in business class. If you bought all 115,000 points that is a total of $2,300. Try and find a round trip business class airfare to Europe for less than $2,300. American also offers "Mileage Multiplier" that allows you to purchase extra points on paid fare tickets. The option is given at check-in however you can call after the flight is completed and still be able to buy the points. These points do not count towards your annual limit. American's AAdvantage program has undergone some significant changes in the 2015/2016 time frame. However even after these changes the program remains a very good program to earn and redeem points for travel anywhere in the world. With the quality of Oneworld carriers and other partners, along with the growing international presence of American itself, you can truly go anywhere using American points. It may be the best frequent flyer program available to travelers today and at a minimum is in the top three. If you reside in one of their hub cities or plan on travel to one of their partner hub cities, you should seriously consider American's program.